I want to give children the option of eating healthier, while still maintaining the convenience of a vending machine. Fresh Healthy Vending, has launched in Northwest Arkansas through franchise owners Dennis and Carla Laing. The Laings currently have 20 Fresh Healthy Vending machines installed throughout the area, and wish to expand by installing additional machines throughout the area, giving the community the option of healthy, natural snacks and beverages such as smoothies, soymilk, fruit, vegetables, yogurt, granola bars, baked chips and natural sodas. Laing purchased the vending machine franchise rights from San Diego-based Fresh Healthy Vending, which offers healthier snacks as an alternative to traditional vending machine junk food of sugary drinks and snacks. Inspired to better their own communities, these entrepreneurial franchise owners are dedicated to improving access to healthier snack and beverage options. The Fresh Healthy Vending machines launching in Northwest Arkansas are some of the 1,700 locations throughout North America, with machines placed in office break rooms, school campuses, shopping malls, hospitals and more. Locally, the Laings have placed machines in Gentry Public Schools, Fayetteville Public Schools, YMCA of Northwest Arkansas, Boys & Girls Club, and other locations where families spend their time. In addition to the healthier vending machine snacks and beverages, Fresh Healthy Vending also produces the Fresh Healthy Café, a vending machine that distributes gourmet organic coffee drinks together with their signature healthy snack options. Our mission at Fresh Healthy Vending is to offer healthy, natural alternatives to junk food--all at the touch of a button. We specialize in locating and dispensing snacks and drinks that meet the needs of the health conscious, ensuring that our products contain few preservative and dyes, and are, whenever possible, organically produced. Don’t sit on the sidelines. The Healthy Vending Revolution is happening now. Join it! Fresh Healthy Vending is the first and largest franchisor of healthy vending machines, providing all-natural drinks, snacks and gourmet coffee to thousands of locations around the country. Fresh Healthy Vending's quest is to help Americans become healthier by providing more nutritious and wholesome snacks and drinks through vending machines. Capitalizing on the growing demand for both healthy snacking and organic coffee, two of the fastest growing consumer segments in the world, Fresh Healthy Vending is an expert in creating profitable vending businesses for franchisees. 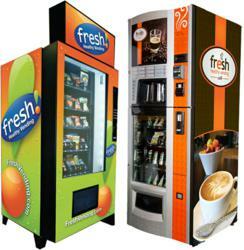 For more information about becoming a Fresh Healthy Vending franchisee, visit http://www.freshvending.com. To demand healthy choices and inquire about receiving a free Fresh Healthy Vending machine where you work, live or play, visit http://www.freshandhealthy.org.